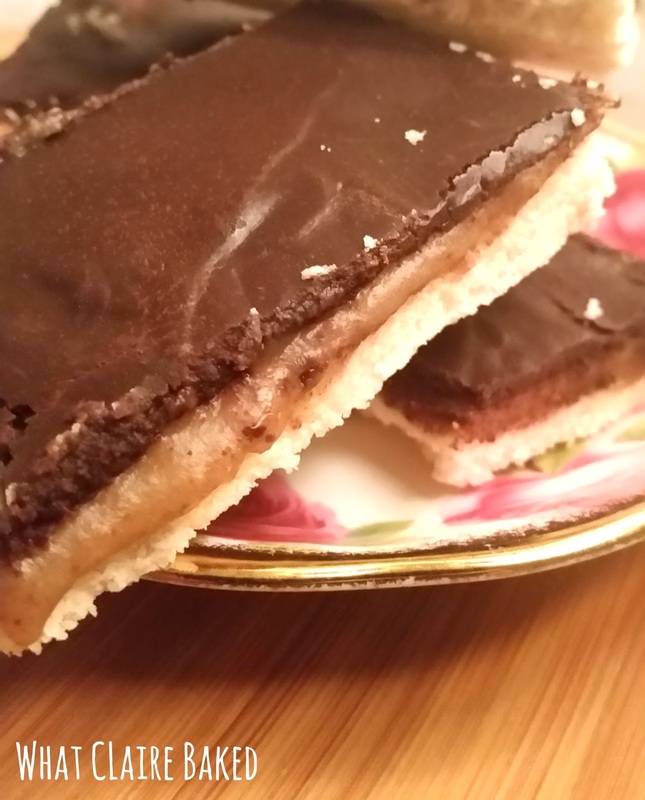 Readers, a miracle happened in the kitchen this week… I made something with substituted ingredients which tasted, not too bad AND remotely close to the real deal. I found the original recipe for these on Pinterest, named as Twix Bars, but in reality, when I made them, they looked more like slices of caramel shortbread. Maybe in America, they don’t get caramel shortbread? Anyway, this actually only uses about 6 ingredients, just reformatted in a lot of different ways. I even ended up with something remotely chocolate like from cocoa powder. Who knew?! This made around 10 slices, and they are REALLY filling, so around 5 days after making them I still have 3 slices in the fridge. Be warned, you really need to keep these refrigerated before you eat them, otherwise the “chocolate” and the “caramel” go really soft and gooey – I made the mistake leaving it on the desk at work, barely edible by the time I got to it in the afternoon. Anyway, many thanks to Bakerita for the original recipe. 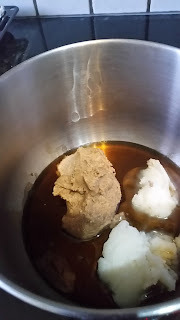 I made my own nut butter for the recipe – easy – ground almonds, in a food processor for a bout 15 minutes. Prepare to be amazed!!!! Line a silicone 8inx8in pan with baking parchment. Combine all ingredients for the base in a bowl and bring together to a dough, using your hands. 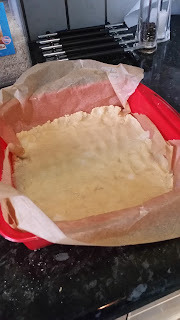 Press the dough into the base of the baking pan and transfer to the oven. Bake for around 8-9 minutes until the biscuit goes golden. Remove from oven and allow to cool in the pan. 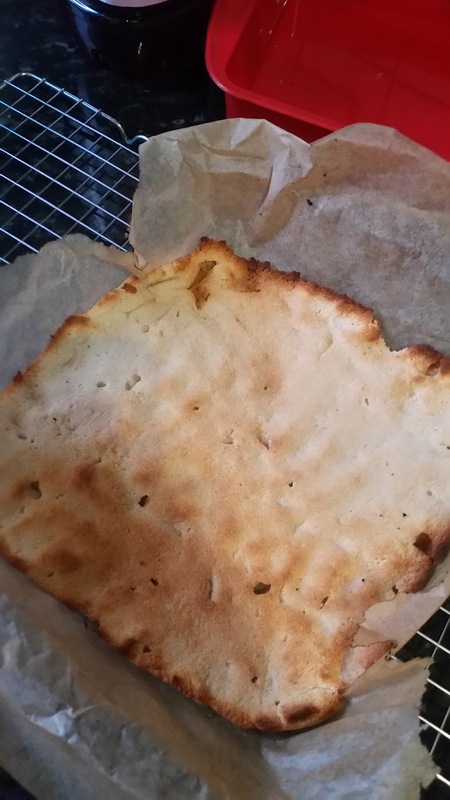 Bake perhaps for 30 seconds less than I did! For the filling, add all filling ingredients to a small pan and gently warm through, stirring, until the ingredients are fully combined. Remove from heat, pour over the biscuit and transfer to the fridge to set. Make the chocolate topping by melting coconut oil and whisking with the maple syrup and cocoa powder. Pour over the set filling and use a silicone spatula to smooth out before returning to the fridge to set. Once set, slice into small rectangles and store in an airtight container in the fridge until ready to serve.